On the surface, automobile tires don’t seem like terribly complex things. Well, decades ago that may have been the case but recently tires have begun to get more complex. In this article, we’ll examine some of the newest features popping up on the planet of automotive tires. In the late 1880s John Dunlop introduced a rubber tire that was inflated with compressed air. The ride of a car with “pneumatic” tires was so superior to the old solid rubber style that many manufacturers switched fast. After this, tire construction was the mostly the same for the next century. This was the case according to the Service manager at Kolosso Chrysler Jeep Dodge RAM, a full-service car dealer in Appleton, WI. It all starts with basic ingredients: carbon black, rubber steel belts and various chemicals like short rubber monomers and other compounds. Nowadays many tire manufacturers utilize special steel molds that the steel belts and rubber compounds are inserted into and then cured under high pressure and heat to make a polymerization reaction that links all the short rubber monomers into long elastic rubber molecules. This results in completed tires after a little bit of time. Like any technology, tire designs and features keep evolving. Here are a few interesting advancements that may make their way to the marketplace. DiscolorTyre – The issue: many car owners can’t effectively tell when their tires are worn out without measuring the depth of the tread grooves. To address that, Bridgestone has created the “DiscolorTyre.” These tires begin their lives as any other black rubber tire, but as tread wear reaches minimum legal level, a layer of bright orange rubber shows up. The tire surface changes color as it wears down. 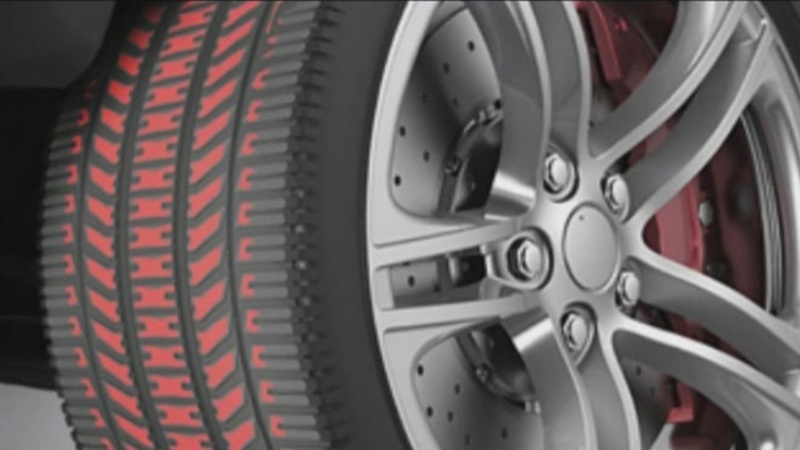 EverGrip – Michelin, a French manufacturer, has invented a tire that will evolve as it wears out. Here’s the concept: tires perform great when new, but as they get older they lose their grip because their grooves get smaller. “EverGrip,” as it’s referred to by Michelin, uses main tread grooves that get wider as they wear down. It’s an interesting idea: tires age and thus become safer. Airless tires – First explored in 2005, Michelin’s “Tweel” is an airless tire that bears almost no resemblance to the rubber tires of today. The Tweel is made of flexible polyurethane spokes, a solid hub, and an outer band of rubber tread. The spiral inner spokes absorb the force from the road while driving to make the tires work. Self-inflating Tires – Several manufacturers for the consumer market are exploring self-inflating tires. Already a technology used for some military vehicles and heavy machinery, self-inflating tires use sensors that measure tire pressure. If the pressure is low, a connected air source inflates the tire during operation. Not only is this a fantastic idea for gas mileage (correctly inflated tires roll with less resistance), it will ensure that the tire surfaces wear more evenly to save the consumer money.